I toyed with the idea of a looking at a Nativity scene for my Christmas masterpiece, and there are certainly plenty of incredible iconic works; but in the end, the more I studied The Census at Bethlehem, the more it related to me on a human level. 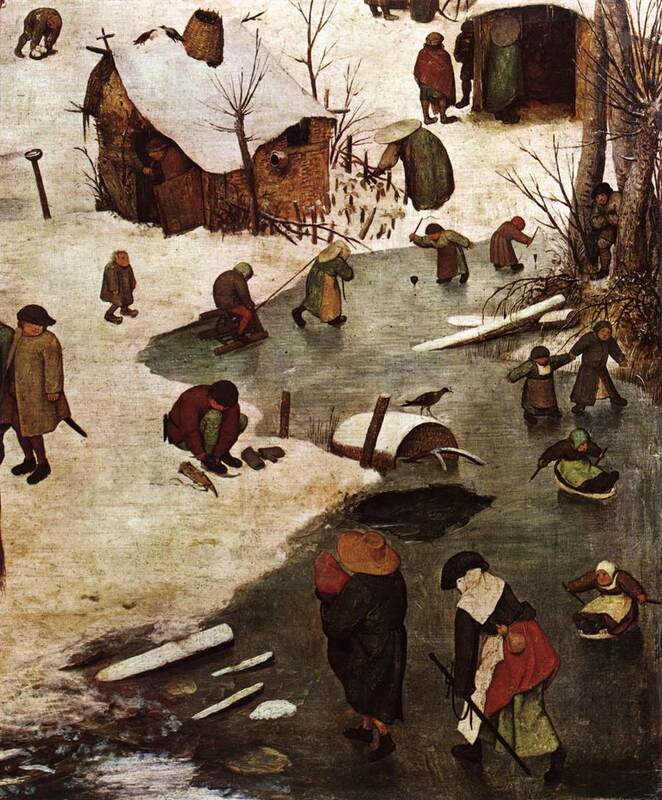 Pieter Bruegel the Elder was a Flemish Renaissance Master, an important influence on the Dutch Golden Age, and THE pioneer of winter scenes. The year before The Census at Bethlehem was completed in 1566, the Netherlands and much of Europe had been in the grip of the coldest winter for a hundred years. Hardships were experienced by the population on a biblical scale; such as famine, disease, riots and a brutal occupation by the Spanish, all of which had hit the population hard. There was no respite from these seasonal struggles, as the winters in Europe for the next 250 years proved to be among the coldest on record, (certainly harsh enough to justify the ominous phrase, “Winter is coming,” used to great effect in Game of Thrones), leading to that time being dubbed as a ‘little Ice Age’. 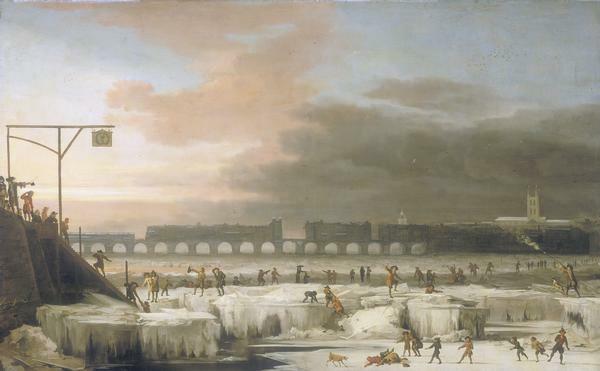 It was so bitterly cold that even the river Thames froze over, which was recorded for posterity on canvas in 1677 by Abraham Hondius, a Dutch painter living in London. You might expect to see a painting of The Census at Bethlehem depicting the central characters of a pregnant Mary and Joseph to actually be in Bethlehem, the ancestral home of Mary’s betrothed, Joseph – but Bruegel takes his subject and his audience on a journey to the City of David in his Flemish homeland – a snowy Brabant village. The decree by Caesar Augustus that all citizens be registered is portrayed on this 116 x 164.5 cm oil on oak panel, and by painting this biblical event in a contemporary setting perhaps Bruegel is also commenting on the hefty taxes imposed by the Spanish regime in the Low Countries. “The historical problems with Luke are even more pronounced. For one thing, we have relatively good records for the reign of Caesar Augustus, and there is no mention anywhere in any of them of an empire-wide census for which everyone had to register by returning to their ancestral home. 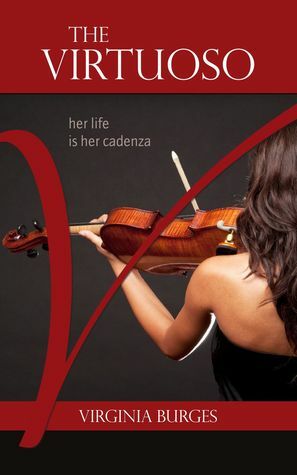 And how could such a thing even be imagined? Joesph returns to Bethlehem because his ancestor David was born there. But David lived a thousand years before Joseph. Are we to imagine that everyone in the Roman Empire was required to return to the homes of their ancestors from a thousand years earlier? If we had a new worldwide census today and each of us had to return to the towns of our ancestors a thousand years back—where would you go? Can you imagine the total disruption of human life that this kind of universal exodus would require? 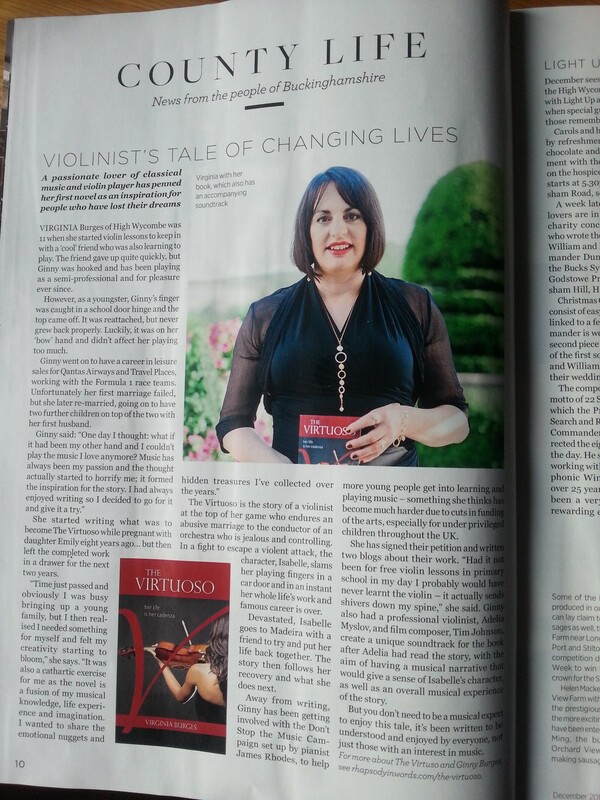 And can you imagine that such a project would never be mentioned in any of the newspapers? There is not a single reference to any such census in any ancient source, apart from Luke. Why then does Luke say there was such a census? The answer may seem obvious to you. He wanted Jesus to be born in Bethlehem, even though he knew he came from Nazareth … there is a prophecy in the Old Testament book of Micah that a savior would come from Bethlehem. What were these Gospel writers to do with the fact that it was widely known that Jesus came from Nazareth? They had to come up with a narrative that explained how he came from Nazareth, in Galilee, a little one-horse town that no one had ever heard of, but was born in Bethlehem, the home of King David, royal ancestor of the Messiah. Certain art historians have sometimes interpreted the pig’s slaughter in political terms. It is feasible to see this as a metaphor for the peasants who were bled dry by excessive taxes levied by Philip II of Spain, which were particularly intolerable during the harsh, famine-ridden winters. Bruegel must have surmised that the painting would hold greater meaning if the people of 16th Century Flanders could relate to the hope of a better future with the happy and uplifting message of the birth of Jesus if it somehow took place in the heart of their own difficult circumstances. This magnificent painting is now on display at the Royal Museums of Fine Arts of Belgium in Brussels, a city Bruegel made his home from 1563 onwards. He was also active as a painter in Antwerp prior to his last decade. His pigments were sourced mainly in Antwerp, and were ground in his studio. The Census at Bethlehem has an abundance of characters going about their chilly business on Christmas Eve, amidst the religious fervour of the birth of Christ, where the Flemish landscape is also a major component. Everywhere you look there is a hive of activity, the freezing landscape is teeming with life. I like that we have an elevated view onto the scene, with Joseph leading Mary (her face barely visible), perched on her trusty steed (donkey), with an ox in tow, unobtrusively blending into the centre foreground, heading towards the hubbub at the Inn. The gathering of people clamouring to register is surely a hint that there’s not going to be any room at the Inn, even one with a ruling Habsburg crest on the wall. The lack of decent accommodation, as we know, meant Mary had to give birth to the Saviour in a stable. I take my hat off to Mary, there was no such thing as Entonox, epidurals, or any pain relief two millennia back, let alone a comfortable bed. Hay might have been okay, but one can imagine it must have been a tad draughty. I’m not sure I would have coped with a procession of wise men, shepherds and worshippers just hours after giving birth in such circumstances, but thankfully Mary rose to occasion for the sake of humanity! 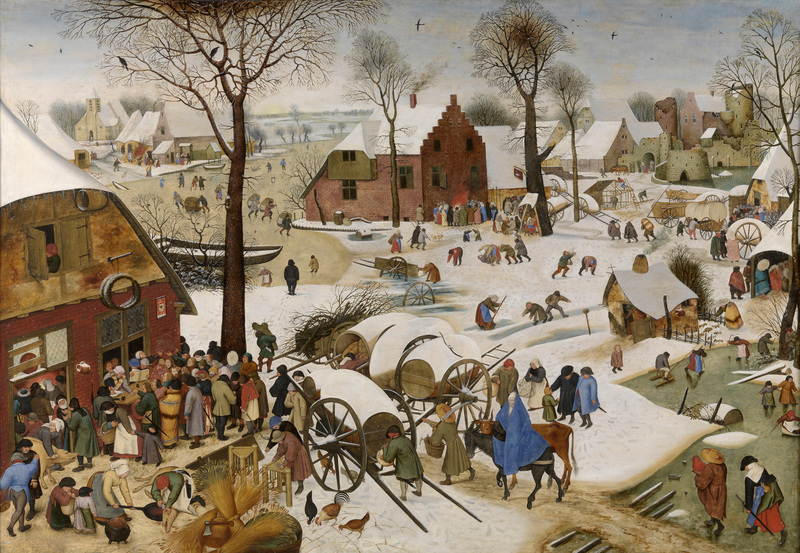 The perspective in The Census at Bethlehem pulls our gaze towards the bottom left as this appears closer, and the tall tree with the setting sun visible through its high, barren branches seems to demarcate the painting in invisible diagonals from top left to bottom right and bottom left to top right, intersecting in the middle where a single spoked carriage wheel lays in the snow. Decay and disease is also part of the picture, as a man with leprosy is sheltered in the little hut. The whiteness of the snow in the centre ground and on the slanting roof tops dazzles against the grey sky and bleakness of unforgiving winter weather, the light in the darkness of winter, as Jesus will become the light of the world. In the top right we can see a ruined castle, (thought to be based on the towers and gates of Amsterdam Castle), a parallel with the dying of an old belief system, or a Pagan way of life, contrasted with the construction of newer buildings and a church across the frozen river, an allegory for a new religion – Christianity. 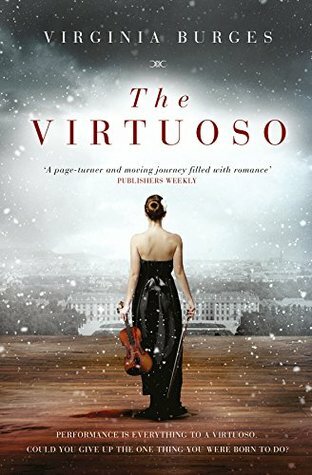 Despite the bone numbing cold, many ordinary citizens have ventured out into the snow, from weary travellers to local residents busily preparing for the Christmas mass and celebration. To think that children over four hundred and fifty years ago were doing just what children would do today, even in the midst of unimaginable cold, generates sympathy with our European ancestors. The joy of skating on ice, throwing snowballs (I loved the touch of white powder stuck to the man’s left shoulder standing with his back to us on the edge of the water), and being generally engaged in wintry play warms your heart. 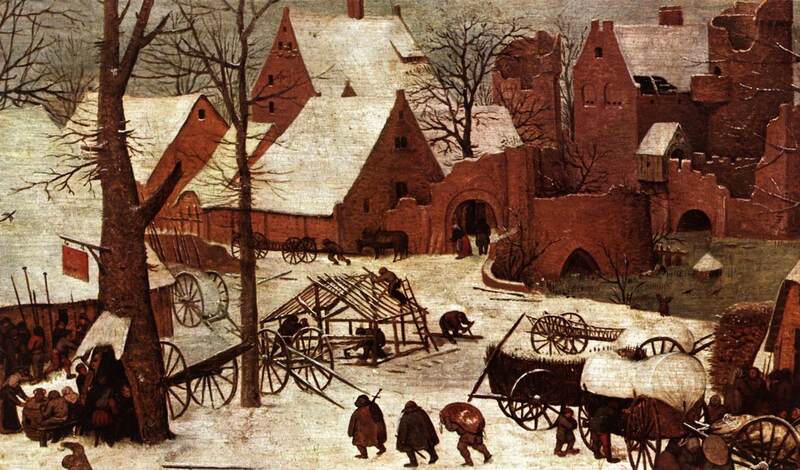 The Census at Bethlehem was a popular painting during Pieter Bruegel the Elder’s lifetime, as were pretty much all of his works, which tended to depict the solid, robust and stocky figures of peasants (quite a few engaged in matrimonial and celebratory settings), combining landscapes with ordinary activities, making him an early pioneer of genre painting. It is said the artist (who would have been categorised as upper-middle class in his day), used to dress as a peasant to gain access to such events and closely observe their activities. 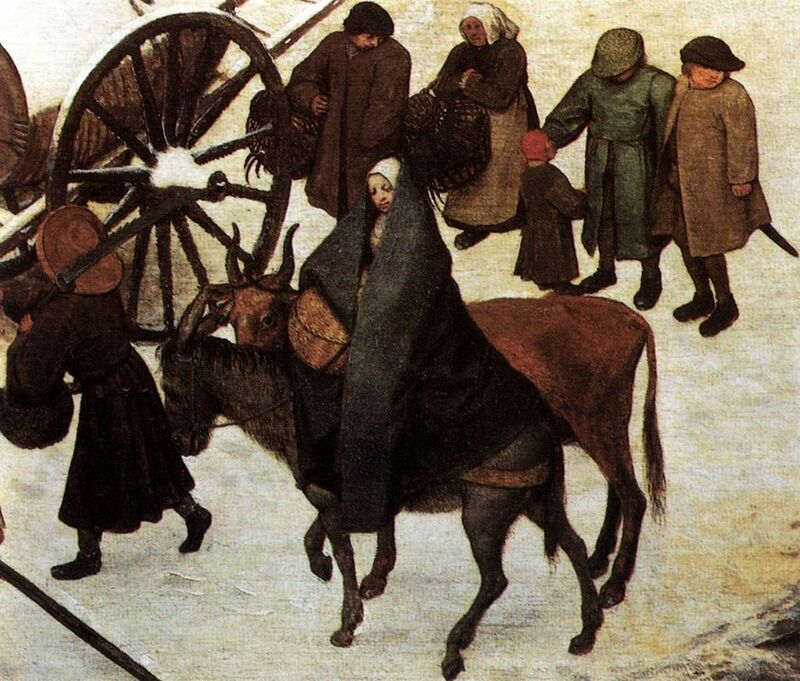 The Census at Bethlehem was copied 14 times, 13 of them were known to be produced by his son, Pieter Brueghel the Younger (spelt conspicuously with an ‘h’); he knew he was on to a good thing! The 14th copy (painted in 1611) caused particular excitement in the art world when it surfaced in 2013 and came to the attention of a respected Old Masters art dealer, Johnny Van Haeften, having been in private ownership for 400 years. Both sons were trained as painters by their maternal grandmother, Mayken Verhulst, a sixteenth-century miniature, tempera and watercolour painter, (hailed as one of the four most important female artists in the Low Countries by Lodovico Guicciardini in 1567), due to the death of their father they were very young. Bruegel’s second son, Jan Brueghel the Elder, differentiated from his brother (who solely focused on replicas of his father’s paintings), with his own original works and became a key figure in the transition to the Dutch Baroque style, frequently collaborating with Peter Paul Rubens. Bruegel was a member of the Antwerp Painter’s Guild. He was known to work by mixing layers that hadn’t dried completely, a technique called ‘alla prima’ or ‘wet on wet’ in English. In contrast to the Flemish artists from the previous century, the light effects are not due to transparency, but the overlay of material and thick impasto brush strokes of colours. This innovation was started by Heironymous Bosch, who was the premier influence on Bruegel, as well as the Italian Renaissance. In other places, whilst the layers are very thin, Bruegel plays with them to obtain stunning nuances, particularly of the white shades. 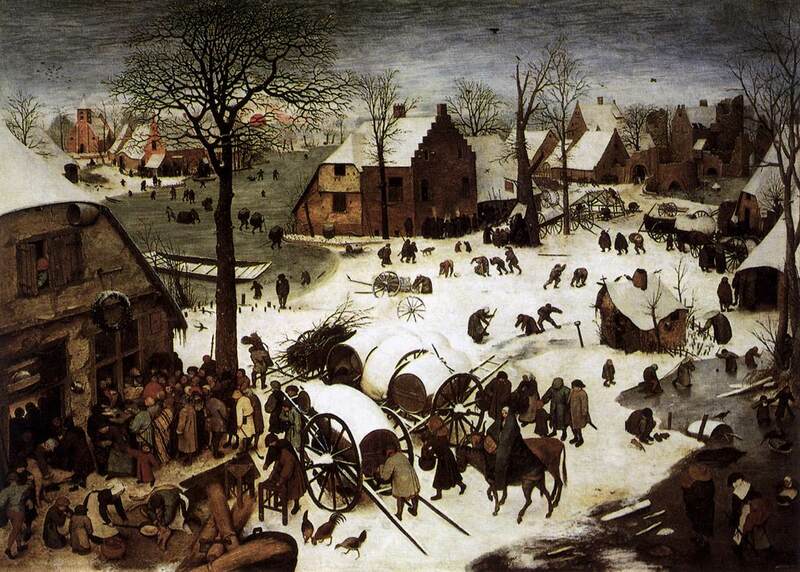 Bruegel was a master of depicting snowy surfaces and winter skies. 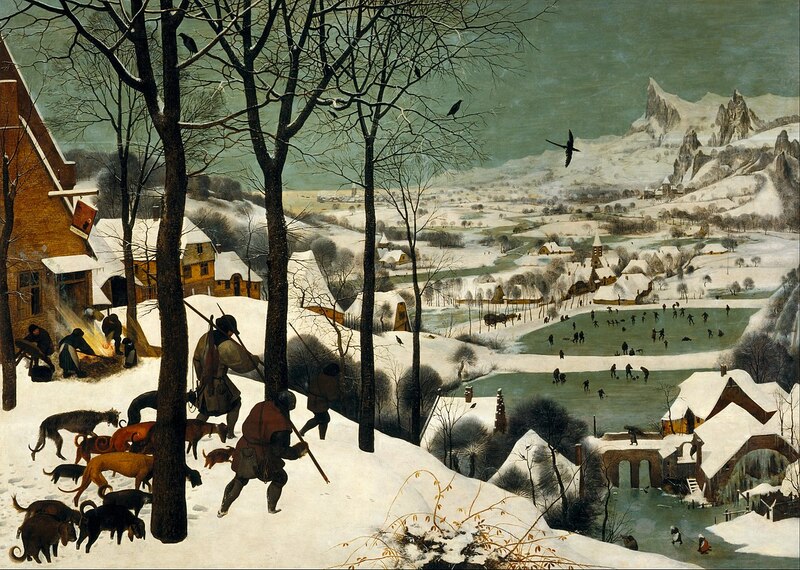 Probably his most famous painting is The Hunters in the Snow (c. 1564). It’s an amazing snowscape that gives a visual gift of desolate beauty and a sense of vast wintry territory in one of the world’s most revered landscapes. Bruegel’s travels to Italy and the influence of the mountainous landscape he would have encountered on his journey in the form of the Alps are juxtaposed against the flat fields of Flanders. The Hunters in the Snow captures something elemental about our common experience of winter, a deep need for shelter, security and warmth against the stark nothingness surrounding our existence. It also offers the viewer a cinematic position over the first winter landscape created in western art. I’m shivering just looking at it! I am reminded of the toughness and resourcefulness of the people of that time, who didn’t have central heating during the ‘little Ice Age’. My brood complained about not having any heating or hot water for five days after our gas combi boiler was condemned a few weeks ago. Woolly jumpers were promptly resurrected from the bottom of drawers. 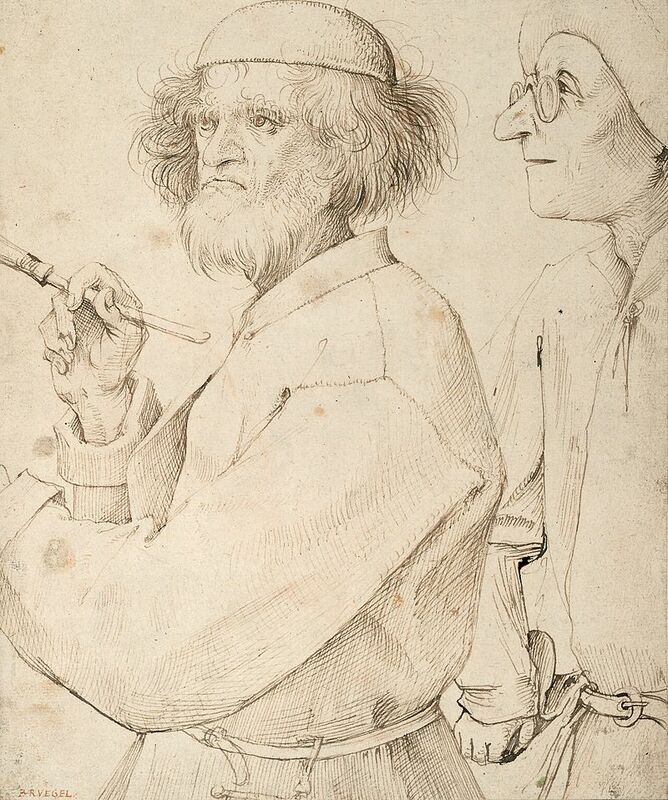 To commemorate the 450th anniversary of the death of Pieter Bruegel the Elder a major exhibition of three quarters of his surviving work is being hosted at the Kunsthistorisches Museum in Vienna. Here is a link to his complete oeuvre of ‘Boschian’ allegories, proverbs, religious subjects, landscapes (including human forms) and genre peasant paintings. Time is rapidly ticking by and I must attend to my brood, plus my usual endless list of last minute preparations, as I am blessed to have all my children together for the first time in a long time this Christmas.